A little while ago, I posted about trying out more shots with different lenses, including views I had photographed before, just to see how using a different lens could affect the composition. Well, here's another example. 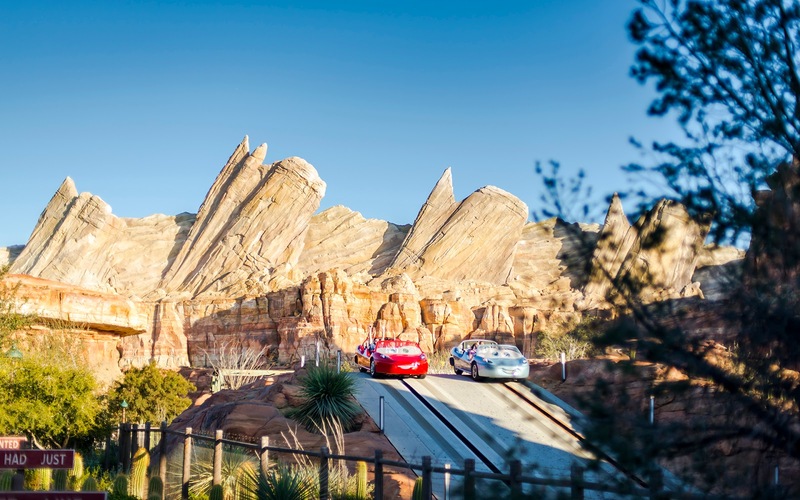 Below is a shot of the racers hauling gas over one of the last hills of Radiator Springs Racers, taken from a 50mm prime lens. In this link is a similar shot taken with a wider angle lens. Even though the crop is pretty similar, you might notice that in shot below, the Cadillac Range seems larger and more "looming over" on the cars, whereas in the linked photo, the cars are more prominent, and the automorphic range seems to recede. This is a prime example of the compression of the depth of field that a longer focal length can achieve. And with knowledge of that effect can come a different way of capturing a scene to suit the concept in the photographer's eye. Pretty neat, right? Two Racers careen over a bunny hill in their driving competition!